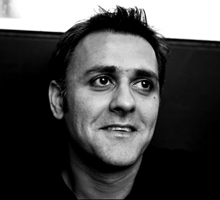 Daljit Nagra - Poetry Live! Daljit Nagra comes from a Punjabi background. He was born and raised in London then Sheffield. He has won several prizes for his poetry. In 2004, he won the Forward Prize for Best Individual Poem for the title poem from his collection, Look We Have Coming to Dover! (Faber & Faber, 2007). This won the Forward Prize for Best First Collection and The South Bank Show Decibel Award. Daljit is on the Board of the Poetry Book Society. He has judged the Samuel Johnson Award 2008, The Guardian First Book Prize 2008, The Foyles Young Poets Competition 2008, The National Poetry Competition 2009. He also hosted the TS Eliot Poetry Readings 2009 and is a regular contributor to programmes on radio. His latest collection, published in 2011, is called Tippoo Sultan’s Incredible White-Man-Eating Tiger Toy-Machine!!! (Faber). It has been shortlisted for the 2011 TS Eliot Prize.